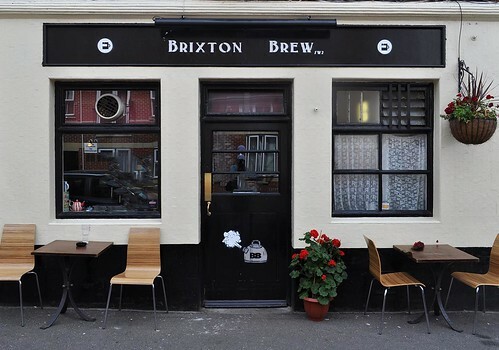 Brixton Brew is open for business! There we were enjoying a nice frosty beverage in the local when the manager pops up and asks if we’d care to do a little work branding their new cafe. We, of course, agreed and set to work on coming up with a few ideas. Once we had the design finalised it was time to get it on the wall. On a dry but very windy day we set to work and the biggest problem we faced on this little commission was ensuring that the lettering was straight, which is not particularly one of our strengths at the best of times although I think we just about got it nailed this time thankfully. Then it was just a case of getting the mug logo and steaming kettle on the door and we were good to go. Partial payment came via a tasty panini and a pint. Job done.